Dave White, the Program Director of SAIL BLACK ROCK in Black Rock, CT, a sailing center created to train sailors from Sacred Heart University (SHU) and Fairfield University in the neighboring town of Fairfield, is on a mission to help colleges and high schools throughout the Northeast launch sailing teams or revitalize inactive ones. We spoke with Dave at SAIL BLACK ROCK’s headquarters at Captain’s Cove Seaport. WindCheck: What inspired you to undertake this project? Dave White: Starting more high school and college teams is key to growing the sport. It was exciting to start Sacred Heart’s program and then revamp Fairfield’s program. Both of those schools should have strong collegiate sailing programs because of their proximity to Long Island Sound…and because collegiate sailing in the United States started in Fairfield in 1928. I’ve learned a lot of things over the past three years of SAIL BLACK ROCK, and in the last year I’ve consulted on high school teams in Massachusetts, Connecticut and New Jersey. SUNY Maritime College asked me to participate on their Waterfront Committee, and I’m also working with the Athletic Director at Trinity College in Hartford to get their sailing team going again. WC: What are the first steps in starting a scholastic sailing team? DW: The first step is to get the institution behind it, and there are many levels at colleges including the administration, alumni, a board of trustees and, most importantly, an enthusiastic group of students. When we started developing the SHU program, I interviewed ten college sailing coaches from various size schools with various program longevity and budgets to learn what makes their programs work. I found that you don’t need a lot of money, it doesn’t have to be a 30-, 40- or 50-year old program, and it doesn’t have to be a varsity program. Many club programs are very successful, with some nationally ranked in the top five percent. Another key thing is for a school to partner with another school and have a joint program. This doubles the resources and the number of sailors, creating a much more robust program. Partnering is working very well for Fairfield and SHU, and upstate we’re going to try to partner Trinity. Case in point on the local high school level, there weren’t enough sailors for a team at any single high school in Stamford, CT, so the coaching leadership created a program that includes five schools, some public and some private. WC: Do collegiate club programs compete on equal terms with varsity teams? DW: Yes. 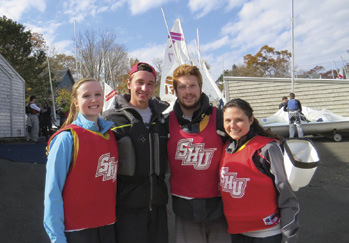 The Intercollegiate Sailing Association (ICSA) controls college sailing in the United States. It is in lieu of the NCAA, and it’s a coach-run organization with student representation. SHU and Fairfield are both club programs run by the students. In our conference, the New England Intercollegiate Sailing Association (NEISA), there are 38 schools that we sail with at weekend regattas. Seventy percent of those are varsity programs, although a couple very strong teams, such as Brown University, are club programs run by students. There are more high school sailing programs in the U.S. than college programs. Many Catholic schools in the Northeast have programs, as well as prep schools and some public schools that are near sailing waters. The Interscholastic Sailing Association (ISSA) has the same structure as the ICSA. Most high school sailing programs are varsity teams, the seasons are longer, and the practice and regatta schedules can be more intense. Most successful programs, whether high school or college, have one thing in common: professional, consistent, adult coaching. WC: How many coaches does a team need? DW: I think the minimum is two. Once you have eight or more boats sailing, you need a race committee boat and a chase boat with a coach in each boat. We have four coaches at SAIL BLACK ROCK, and we need at least two available most times. Three of our coaches are over 50 and one is 24, so we provide different perspectives on teaching sailing, coaching, and life skills. It’s important to have coaches who can give a well- rounded view of the sport. WC: Where can start-up teams find affordable race boats, chase boats, and equipment? DW: Some boats are donated and others are purchased by alumni or the institution. It’s also important to have coaches who are connected to the sailing community. When we were starting SAIL BLACK ROCK and looking for boats, I met Bill Crane, the Chairman of LaserPerformance, at a safety seminar at Larchmont Yacht Club. Bill said, “Call Adam Werblow, the coach at St. Mary’s. He keeps a database of all the collegiate fleets in the U.S.” I called Adam and said we wanted to match the six boats Fairfield owned with boats SHU would purchase. Within ten seconds he said, “I’ve got a fleet available in Wisconsin, and they’re from the same fleet built in 1998 that Fairfield owns!” A new FJ might be $10,000. We paid $1,300 apiece for ours and they’re in pretty good condition. Sail1Design has an excellent marketplace for high school and collegiate fleets, and US Sailing, Scuttlebutt and WindCheck also have classified sections. The SAIL BLACK ROCK Foundation has found outboard engines on craigslist, and we recently bought an Yngling and rowing dinghy there. There are also sources for sails that we didn’t have a few years ago. We bought a new Laser sail for $139 from Intensity Sails in Warwick, RI and it’s great. It’s not class-legal but it’s great for practice…and a class-legal sail is $700. We’d love to get new FJ sails for our entire fleet from Intensity. A lot of supplies are often provided free or at cost by manufacturers and retailers. I sent an email to McLube asking for a couple spray cans, and they sent more than five years’ worth of all types of lubricants. Star brite is another huge supporter. I asked for a couple brushes, and they sent eight boxes of supplies. Yale Cordage is providing line Halyards at cost, and ACR recently sent 40 whistles. We’ve also had great support from J. Russell Jinishian Gallery, Inc. in Fairfield, The Boat Locker, which just moved close to us in Bridgeport, West Marine in Stamford, Brewer Yacht Yards, the Young Mariners Foundation in Stamford, Sea Scout Ship 110, SailAway Sailing School in Black Rock, North Sails in Milford, and our primary supporter, the Williams family, owners of Captain’s Cove Seaport, which houses all our boats, docks, heads, classroom and storage facilities. WC: How many sailors does a new team need? DW: The minimum to get some momentum going is 12: six skippers and six crew. Most healthy teams have anywhere from 20 to 40 sailors…Yale has 40 to 50, and Tufts has 60-plus. WC: Does promoting sailing as a co-ed sport entice students, particularly those who may have never sailed, to try out for the team? DW: Yes. Sailing is co-ed because of the ideal crew weights for collegiate dinghies. The optimal crew weight for an FJ is about 280 pounds, and the best way to achieve that is with a male and female. That also creates more of a fun factor, and we’ve had some romances develop. When I was team captain a long time ago at UConn, the former Commodore and one of the skippers married. 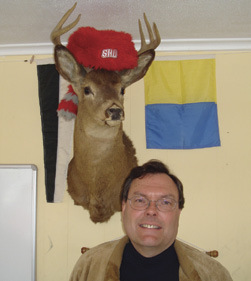 Fairfield Stags mascot with the SHU Pioneers cap. WC: What are some ways for new teams to raise funds? DW: One of the keys is to get alumni and trustees involved. Sometimes a passionate alum will make a significant contribution. I’ve had meetings with the University of Connecticut Foundation to establish a separate foundation within it to support sailing. A UConn sailor a few years ahead of me is now a member of a US Olympic Committee. One of the universities does not pay for fuel for transportation, so one of our coaches received donations from Santa Fuel and Charles Schwab for that purpose. We’ve also received support from the Commodore’s office of the New York Yacht Club, the flag officers of Stamford Yacht Club, and Black Rock Yacht Club and Fayerweather Yacht Club on Black Rock Harbor. A dinner at a yacht club is an excellent fundraiser, and you can also do individual fundraising. If coaches and students start networking, you can make serious things happen. WC: How can schools build awareness of new sailing teams? DW: It’s important to host a regatta. Word gets around to high school sailors when a college is hosting a regatta, and if they want to sail in college that could be the “closer” for them to pick that school. We’re making plans to host our first regatta, the Sacred Heart University Invitational, at Captain’s Cove on September 20 & 21. The Boat Locker is bringing a high performance demo boat – an RS 400, I believe – for sailors to take out between race sets. We’re going to encourage everyone to enjoy the dining at Captain’s Cove, and we’re planning a party for parents and coaches at the upstairs bar. A number of schools are getting into small keelboat racing. Brown uses Sonars, the service academies have Colgate 26s, and Salve Regina has eight Ynglings. That’s the reason we boughtan Yngling. She should be ready for training to begin next fall. I’m also big on big boat racing, and our friend Dave Otterbein loaned his Tripp 37 for last year’s Intercollegiate Offshore Regatta. We sailed with five sailors from Fairfield and five from SHU, and Dave has agreed to let us race the boat again this October. Other vessels in our fleet include a Hobie 16 that we use for pure fun. I think collegiate sailing should become involved with catamarans because of the America’s Cup and the Olympics. Programs should also promote parental involvement. We brought our large inflatable boat to a regatta at Yale, and took 10 or 12 parents out to watch the racing all day. One SHU mom bakes desserts for regattas, and she brought over a hundred warm brownies to an event at Fordham. Much of the pleasure is in seeing the same people at each regatta, and it becomes a com munity. This sport should be as much fun for parents and coaches as it is for the sailors, and I hope this article will encourage more people to get youth programs going! WindCheck: What inspired you to undertake this project? Dave White: Starting more high school and college teams is key to growing the sport. It was exciting to start Sacred Heart’s program and then revamp Fairfield’s program. Both of those schools should have strong collegiate sailing programs because of their proximity to Long Island Sound…and because collegiate sailing in the United States started in Fairfield in 1928.